This recipe is the result of an unbelievably successful experiment. The smoky brisket cheese sandwich was borne out of a moment of inspiration brought on by a meal of homemade Philly cheese steaks. The rest is history. My good old sister (don't tell her I said old) made up some homemade cheese steak sandwiches a while back. Thinly sliced beef was quickly cooked in a skillet with onions, and then Velveeta cheese was added to the pan and stirred in, making a gooey mess that tasted great inside a hamburger bun. While chowing down a few sandwiches, an interesting idea was brought up. Why not use leftover smoked brisket instead of plain sliced beef in these cheesy sandwiches. Well, leftover brisket is hard to come by in these parts, so the next day we smoked a brisket for experimental purposes. After the brisket had smoked to tender perfection, we sliced off about a pound of the falling-apart-tender meat. 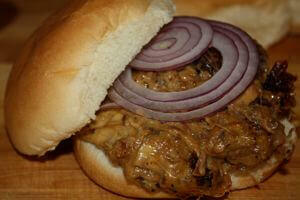 A medium onion was thinly sliced and cooked in a skillet until tender, and the brisket was added. A half-pound or so of Velveeta was chunked and added to the skillet. 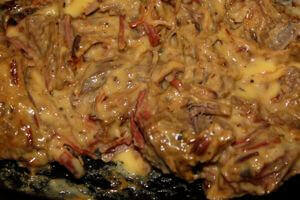 Over medium-low heat, the cheese was melted into the brisket and onion mixture. When placed between the top and bottom slices of a hoagy bun, the smoky brisket cheese sandwich it created was a work of culinary art. The flavor was much better than a regular cheese steak.